Today I decided to do a dry run as to how our mornings will go starting next week. When I am back at work. Work. Traffic. Client demands. Okay, moving on. This dry run was inspired by Laura C who plans everything in advance (the whole birthday cake thing amazed me). Penny was wide awake at 5 am but I sent Husband in to swaddle her and she went back to sleep. I turn on the monitor. 6:15 am - cute little shrills/shrieks from Ned. Discussion with Husband: "Do you want me to give Penny her medicine?" [This is our form of negotiation - I'm really asking, do you have the energy so I can steal a bit more sleep? He's exhausted so I do it so he can get a bit more sleep.] I give Ned a pacifier to no real effect. I give Penny her medicine. She's awake so I unswaddle her and turn Ned from his tummy to his back - but keep them in the dark. I prepare bottles (using premade formula; Nanny makes pitchers of formula for the day when she arrives). Brush teeth, floss and whiten. 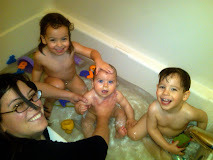 Jump in shower after letting Husband know he's in charge and that Penny can't eat until 6:45. Husband gets up and tries to stall the kids by putting them in the same crib with mobile (buys about 5 mins). 6:30ish he feeds Ned after a diaper change. I'm out of the shower and I moisturize face, add some hair product and put up my hair (so it stays wet). 6:40ish I feed Penny. More diaper changes, putting them in clothes. Kids go downstairs in exersaucers about 7 am and they play while I run upstairs and blowdry my hair - it does not turn out as well as I hoped. I then feed the kids their solid food. Today Husband has a slow start so he's in his robe and made coffee (I'm not getting used to that). I hope to eat something while I feed the kids their solids (so we have breakfast together) but need to go grocery shopping before that can happen. I play with the kids until they go down for their first nap at 8:20 am - this includes a blowout diaper for Ned complete with outfit change and a new diaper for Ms. Sweet P. Nanny arrives at 8:30 am. I will leave by 9 am and pray it only takes me 30-45 mins to get to work. 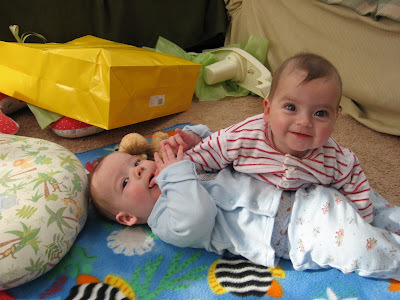 How do people get infant twins out of the house to daycare? Normally I'd put makeup on and get dressed after the tykes go down for naps. Today I'm blogging. Husband and I need to be better about picking up the house at night before bed (instead of vegging in front of the TV until we're too tired to do any chores). Fortunately Nanny empties the dishwasher and washes and folds the kids clothes. Time change is coming up...I think I'm going to have to get up and be fully washed and hair and makeup done before the kids are up since they won't be napping until after the nanny gets here. It can be tough to get up early when I often work as late as 10 or 11 pm but I don't want to miss any time with the kids. Sheesh....I'm a working mom and you make me tired before you even leave for work :) It will work but as people have commented, it will take some time. Sleep will be so important....trying to go to bed a little earlier....Have a good weekend enjoying them babies, Monday will come soon enough. I'm glad I could inspire a dry run! I think it helps my confidence. It takes an hour every day for us to get the boys up and out the door... that time has never changed! I always think that sometime in the future, it will take less time but it always takes an hour. It used to be bottles + solids, now they take their good old time feeding themselves. One thing that Jon and I do is switch off every morning who has to get up early with the kids. Then there is no negotiating or discussion in the morning. That's helped solve a lot of fights. If he's been traveling, he'll take a couple of days in a row to make up for me having to be the one to get up. Oh yeah, we also have a rule that we don't turn the tv on until all the chores are done. Then we can veg all night guilt free! I'm sure you'll do great! Be sure to allot extra time on Monday for crying and missing the kids. It happens to everyone the first time. Even though I was really excited about going back to work, I still balled like a baby and called my working mom friends for reassurance I was doing the right thing. W...o...w... That sounds like a marathon and sprint - combined. But yes, practice makes perfect and soon it will be something you could (will??) do in your sleep. You'll be fine - you sound super prepared! Just a small hint - do not put your blouse/top on before you leave. Use some kind of old sweater, robe, etc. This decreases the number of times you will need to change your blouse because of a blow out, spit up, puke, rasberry of food all over you. Right before you leave and after you kiss the kids good bye, change into your blouse and you will be good to go. I haven't even had my LO and this point makes me very thankful for my current 30 minute routine! I can get up at 5:30 a.m. or 6:30 a.m. and still not get out the door, the kids (almost 2 and 5 months) to daycare, and to my desk until 9:30 or 10 a.m. And we live only 10 miles from downtown. It is hard, but you get used to it. Whatever you have becomes your new normal. And, I promise you this: You'll relish the first 10 minutes at your desk with a hot cup of coffee every morning! It takes me an hour to get the kids out the door in the morning too. And that's with one kid who can potty and dress himself, and neither one needs to be spoon-fed. Not to mention I don't even have to shower or put on makeup in the morning to go teach. So if you can do diapers, clothes, feeding, shower, hair, makeup... all before 8:30? You win. Will be thinking about you tonight and tomorrow as you head into the new routine! I am up at 6 or 6.30. I usually do my hair the night before and my makeup during the commute....but I still end up not getting to work until after 9....and that is with a hubby home on paternity leave!